The Groundsmaster® 5910 is loaded with productivity boosting advantages like the Cummins® turbo-charged, 99 hp (73.8 kw), diesel engine (biodiesel-ready, up to B20), SmartCool™ System with auto-reversing cooling fan and onboard InfoCenter™ diagnostics. 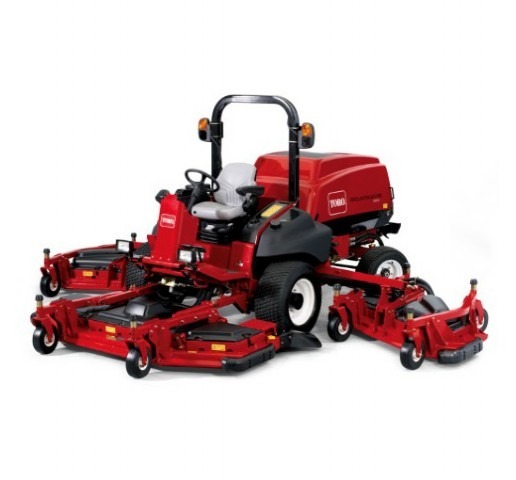 Optional snow thrower or rotary brooms make the Groundsmaster® 5910-D an all year round machine. Get more productivity with a surprising mix of fuel flexibility, efficiency, low emissions and unstoppable power. The gutsy Cummins QSB3.3 inline 4-cylinder engine puts out 99 hp (74 kW) and 306 lb-ft (415 N·m) of torque to cut the thickest, wettest grass you can find. All while exceeding EPA Tier 3 and EU emissions standards for non-raod diesel engines. To mow between objects or along narrower areas, operators may raise either left or right wing decks (142` (3.6 m) width of cut) as well as both decks (92` (2.3 m) width of cut). The cutting units can be set from 1-6` (2.5-15.2 cm) to handle a wide variety of conditions. The 5900/5910 Series is all about covering maximum ground. With the cutting decks down, you get a full 16′ (4.9 m) cut capable of mowing more the 100 acres (40.5 hectares) per day. Torque @ rpm (lb.-ft.) . Forward 0-10.8 mph (17.4 km/h). Air conditioning, heat, opening front and rear windows.